Whether making cake stands or candles, Fresh Pastry Stand’s Deva Mirel finds inspiration in the vintage kitchen and its contents. Fresh Pastry Stand has officially taken over the apartment above the carport at Deva Mirel’s Alachua, FL home. 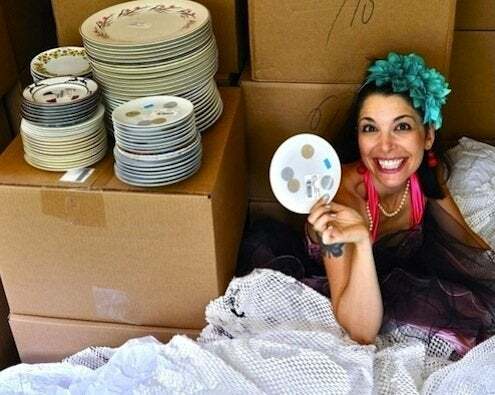 In one area of her studio, Deva is designing 350 china display stands for an upcoming flash sale on Fab.com. In another, she’s developing her first wholesale line of beeswax candles shaped and textured like old embossed glass bottles. (Deva recently got funding from a Kickstarter drive.) 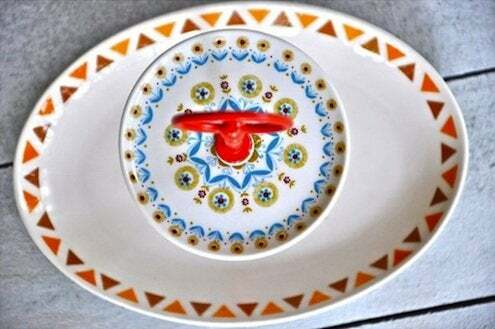 Much of the floor space and a good many surfaces are devoted to the vintage plates, antique glass, and other collectible household items awaiting creative reinvention. Husband Max drills the plates; the girls play with their favorite candles. What began as a modest Etsy shop has snowballed into a family-run factory, and everyone plays a part. 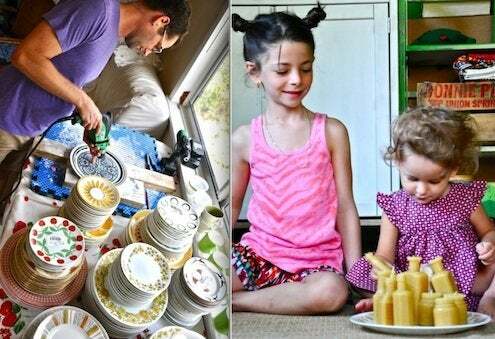 Deva’s husband Max is designated plate driller, the children add cuteness to product shots as needed, and Deva focuses on design. 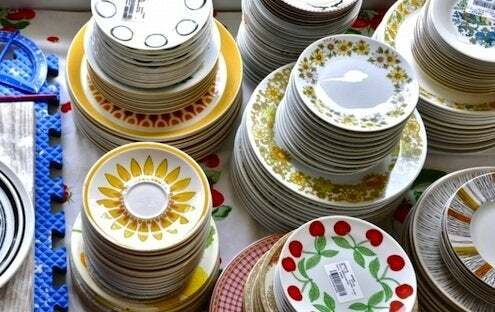 With the cake stands, Deva enjoys the hunt for great plates and the art of combining complimentary patterns, colors, and sizes. With the candles, she looks for vessels with texture, script lettering, and kitsch graphics. These crafty ventures are a natural next step for Deva, a resourceful free spirit. When she lived in a 19th-century Pennsylvania farmhouse with fruit tree-covered grounds, she started to make and sell jam. When she moved to central Florida, where estate sales and bee farms are abundant, producing new, beautiful, and functional things from readily available and inexpensive local resources—old china, for example, and beeswax—seemed appropriate. For Deva, it feels right and good to be making a community-driven product. 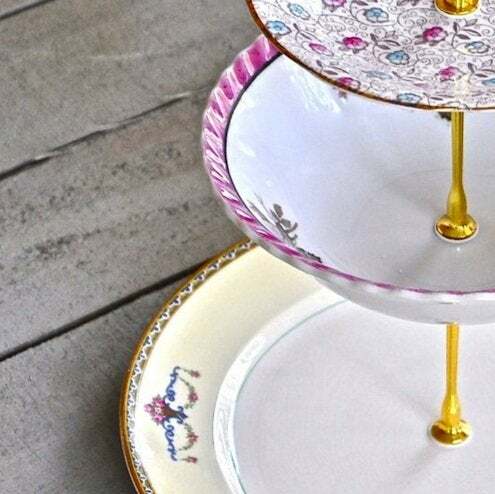 Three-tiered plate stand in vintage purple china pieces. The multipurpose tiered stands are Deva’s hottest item. Used for serving, showing, and storing, they are a host’s favorite tabletop decoration, wonderfully accommodating hors d’oeuvres and small desserts. Among other uses, Deva’s tiered stands fulfill a fashionista’s need to stylishly stow earrings and bangles. And for the space-saving obsessed, like me, these stands make great vertical desk organizers. 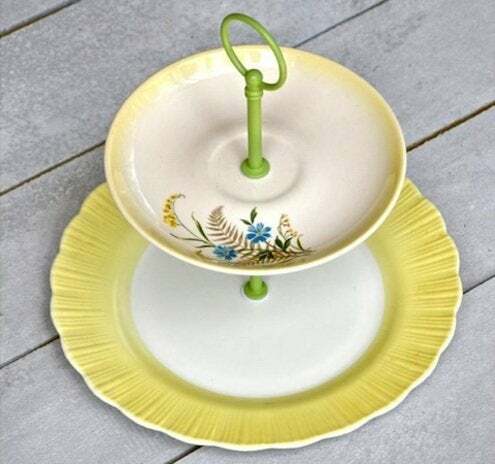 A three-tier Fresh Pastry Stand server averages $140 plus shipping. For more, visit Fresh Pastry Stand.